Even without Constantinople, prices are steady, and although it may be months or even years before ETH Futures gain traction, bulls are vibrant. At spot rates, there is a demand for ETH and prices might soar to $170 by end month. A day after Constantinople, Ether prices are faring quite well, and as developers prepare for another conference on Friday to deliberate and fix the next launch date, it seems as the ETH Futures hang won’t leave. While CBoE and CME Bitcoin Futures went live 13 months ago, their dismal performance means investors would take a cautious, wait-and-see approach even if the CFTC decides to approve Ethereum Futures. Although Paul Chou of LedgerX won’t discount possibilities of such a product in 2019, he agrees that the market isn’t ready for the product. That’s not all, Jeff Bandman—a Former advisor of the CFTC said the planned shift from proof of work to proof of stake would complicate regulation amplifying risks related to a product that runs from such a system and simultaneously confusing developers. According to these analysts, the fact that PoS system requires coin staking, regulators would interpret it as potential risk. As debate rage on the fitness of Ethereum Futures, ETH is struggling against sellers but bullish. The coin slide 19 percent in the last week and down 2.9 percent in the previous day. However, since prices are above $120, yesterday’s trade plan holds and moving on, aggressive traders can fine-tune their entries in lower time frames with tight stops at Jan 14 lows. We retain this bullish stance because not only are bars consolidating but the fact that they are inside a bull bar places buyer at an advantage solely from an effort versus result point of view. Then again, the confirmation of the importance of $120, a support level by Jan 14 double bar bull reversal pattern off the 61.8 percent Fibonacci level drawn on Dec 2018 high low mean there are more chances of a rally above $150 in the short-term. To reiterate our stand, conservative, risk-averse traders ought to buy ETH once there is high volume, wide range bars above $170. At the same time, once prices race above $140 or Jan 14 highs, aggressive traders can buy at spot rates with targets at $170 and stops at $120. Trade volumes are low and for our immediate trade conditions to be valid, then bull bars thrusting ETH prices above $140 should be at the back of a sharp rise in market participation. Volumes should exceed recent averages of 347k on the lower limit, above Jan 14’s of 378k and on the upper edge surpass Jan 10’s of 684k. 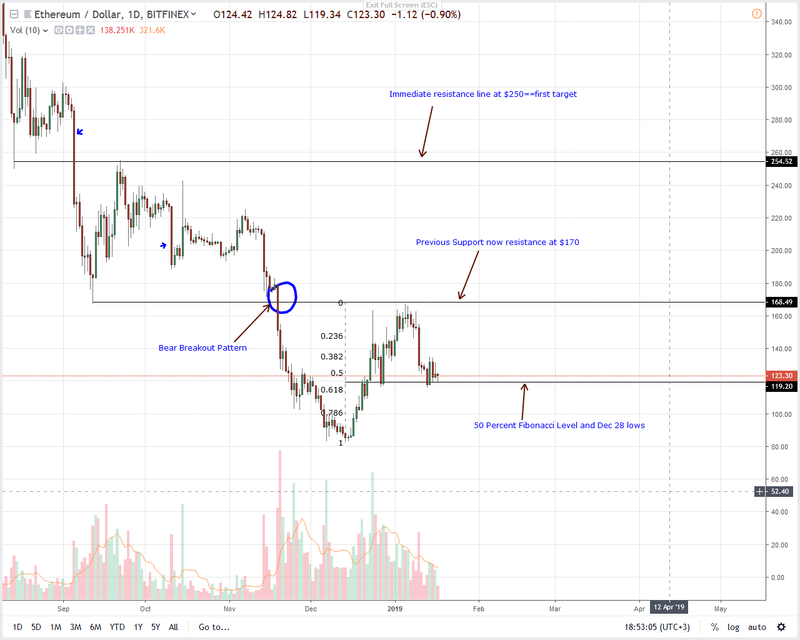 The post Ethereum Price Analysis: ETH Set for $150, Bull Pin Bar Prints appeared first on NewsBTC.